Sener Global engineering and technology group, together with its engineering, procurement and construction partners Emvelo and Cobra, has announced the completion of the Ilanga-1 concentrated solar power plant. The EPC partners were awarded the certificate to initiate commercial operation of the turnkey solar thermal power project, located at Karoshoek Solar Valley, on 30 November, at the conclusion of construction, commissioning and testing of the 100 MWe plant. It has been handed over to the owner, Karoshoek Solar One (RF) Pty Ltd and will supply electricity to the national grid through Eskom, the South African electricity public utility. “We are particularly pleased that [the plant] was completed on time, within budget, within the required quality standards, in line with the contracted output performance and within acceptable safety standards. We are also pleased with the level of localisation, BBBEE (Broad-Based Black Economic Empowerment), skills development and job creation that was achieved on the project.” said Siyabonga Mbanjwa, regional managing director for SENER Southern Africa. “This is the first CSP plant in the history of the South African Renewable Energy Independent Power Producer Program (REIPPPP) that was conceived and developed by a 100% black owned South African entity. 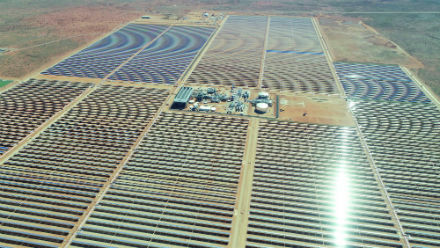 With a 550 MWe pipeline of projects that are ‘shovel ready’ at Karoshoek Solar Valley, the potential to localise, create jobs and provide business opportunities to new youth and women led SMMEs is colossal and what is required is for government to ensure that CSP remains a part of its energy mix policy and is included in the Draft IRP” said Pancho Ndebele, founder of Emvelo. The joint venture of SENER, Cobra and Emvelo was appointed by Karoshoek Solar One (RF) Pty Ltd to provide engineering, procurement and construction services as well as operation and maintenance for the project. The Ilanga-1 plant is made up of 266 SENERtrough loops, with approximately 870 000 square metres of curved mirrors, and is equipped with a molten salt storage system by Sener that allows enough thermal energy storage to extend the operational capacity of the plant by 5 hours. SENERtrough collectors, a parabolic trough technology, are also specifically designed and patented by Sener. In line with government’s four accords, emanating from the New Growth Path (NGP) – namely basic education, skills development, local procurement and the green economy – approximately 1500 jobs were created during the construction phase. It is estimated that Ilanga-1 will supply energy to around 100 000 homes and avoid the emission of 90 000 tons of CO2 per year over a period of 20 years.